For chief executives, choosing the right time to leave is almost never easy. Just ask Keith Guericke, who stepped down as chief executive officer of Essex Property Trust Inc. (NYSE: ESS) at the end of 2010 to assume the role of vice chairman with the company. Guericke, 62 at the time, could have served much longer, despite his tenure at the company of more than three decades. But that would have taken away from his colleague Michael Schall, who was 53 at the time. If Guericke stayed another five years, Schall would have been 58, diminishing the successor’s chances of a lengthy stay at the helm. Essex also was in a good spot for a transition, beyond the financial crisis and enjoying a robust market for multifamily housing. While CEO succession is a tough task for all companies, REITs that do it best benefit from stable management and, in turn, better valuations in the eyes of investors. A company’s management team is an essential factor investors and analysts use in evaluating a company, and they want the reassurance that the company’s strategic plan can continue and grow after the current leadership has left. Successful companies in this regard generally focus on building a nucleus of talent at the top level. They also place a high priority on finding future leaders in the middle ranks. In the grooming of potential successors, they make sure executives get exposure to the board. Additionally, they often rotate managers to different departments to round out resumes. Focus on personal growth is another key. Often, companies that receive the highest valuation have strong balance sheet management and capital allocation, but these REITs have also tended to have smooth transitions at the top. For example, AvalonBay Communities Inc. (NYSE: AVB), Essex Property Trust and BRE Properties Inc. (NYSE: BRE) all had forward-looking estimated 2012 FFO multiples greater than 20 as of Nov. 30, ahead of most REIT peers in the residential sector. Among mall owners, and Taubman Centers Inc. (NYSE: TCO) is a leader in the sector, and Vornado Realty Trust (NYSE: VNO) is a leader in the diversified category. All of these REITs are widely considered to have had smooth management transitions and deep talent in their ranks. Often though, outsiders don’t come into a company with the same loyalty as long-time lieutenants, or they don’t fit well culturally. Sunstone Hotel Investors Inc. (NYSE: SHO) recruited Steven Goldman from Hyatt Hotels Corp. (NYSE: H) to succeed founder Robert Alter in March 2007. Yet, Goldman left at end of March 2008 to serve as Hilton Hotels Corp.’s president of global real estate and development. Alter stepped back into the chief executive role, and recruited Arthur Buser in July from the Hotels Americas division of Jones Lang LaSalle (NYSE: JLL) to serve as Sunstone’s president, then chief executive a year later. Yet, Buser and the company parted ways at the end of 2010. Simply put, good succession plans are well thought out. For potential successors, a chief executive needs to identify strengths and weaknesses of each candidate, and a road map should be developed to fill in the gaps. Companies need to have in essence two plans: One for a situation where the chief executive gets hit by the proverbial bus. Who could step in today, at a moment’s notice? The other plan is more long-term in nature, focused on grooming candidates. Even so, this latter approach needs to be refreshed and will change over time, executives say. A REIT’s needs in 2009, in the wake of the financial crisis, would have tended to demand a stronger person in finance than operations, given the capital-raising needs of the industry, notes Connie Moore, president and chief executive officer of BRE. Rand Griffin’s successor as CEO. “It depends on what is going on in the organization and what skill sets you need, not only for the short term but long term,” Moore says. To be prepared for long-term plans, companies need to make sure they have strong bench strength. “Ensuring that you have high-caliber individuals on the ‘bench’ should always be the goal; therefore, grooming people for a future position starts many years in advance,” says Rand Griffin, who is slated to retire as CEO of Corporate Office Properties Trust (NYSE: OFC) at the end of March. Corporate Office’s effort to identify a successor to Griffin actually began two years before its announcement in September 2011 that the company’s president, Roger Waesche, would be taking over. For Sunstone, work had to be done rebuilding the foundation before transition plans could be laid. Sunstone had cut back on management in 2009 due to the fallout from the financial crisis, so Cruse set about rebuilding the ranks in the first half of 2011, tapping long-term contacts. Cruse recruited John Arabia from Green Street Advisors to fill the CFO spot he vacated. Cruse tapped David Horowitz to run Sunstone’s convention hotels. Horowitz had been general manager at Sunstone’s Hyatt Regency Century Plaza in Los Angeles. Cruse brought on Cormac O’Modhrain as group vice president of asset management; O’Modhrain was president of hotel management at CIM Group. Cruse also hired Robert Springer as senior vice president of acquisitions; Springer had worked in Goldman, Sachs & Co.’s merchant banking division. REITs are also mindful to ensure the people they are grooming will stick around. Companies that might have a CEO destined to stay in the position a while longer face the question of how to retain aspiring executives looking for career advancement. AvalonBay announced last June that Bryce Blair, who now serves as chairman, would hand over the CEO reins to Timothy Naughton at the end of 2011. Blair emphasizes the importance of identifying talented employees within the company ranks. To be sure, cash and equity compensation must be competitive with other real estate companies. But recognition in other ways is also important, executives say. 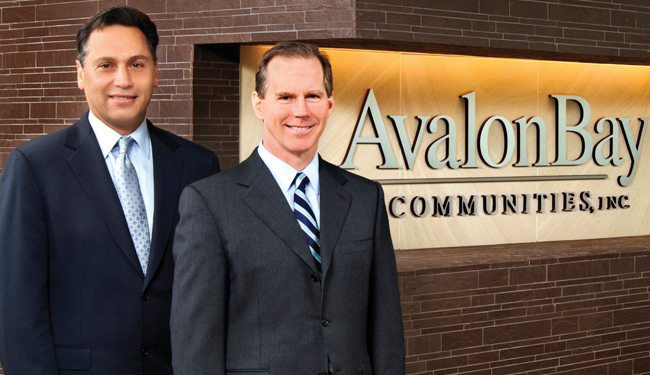 AvalonBay puts together specific career development plans for each individual, identifying strengths and weaknesses. Outside courses at executive programs at Harvard Business School and Wharton School help fill in gaps. The company also conducts “360 feedbacks,” where employees receive anonymous reviews from above and below in the hierarchy. Rotation into new positions is another key ingredient toward development. Cruse arrived at Sunstone in 2005, after having worked in corporate finance at Host Marriott Corp., the predecessor of Host Hotels & Resorts Inc. (NYSE: HST). At Sunstone, he first served in the post of senior vice president of asset management and corporate transactions, then assumed the role of chief financial officer in 2007, rounding out his background before being promoted to chief executive officer in 2010. Companies also need to focus on getting potential future leaders acquainted with the board. BRE’s Moore makes sure senior vice presidents and vice presidents frequent the board meetings. For example, for BRE’s review of its 2012 budget, two employees who worked on the budget for John Schissel, chief financial officer, sat in on the meeting. “They can hear the kinds of questions the board is asking, to see where there is pushback,” Moore says. It also never hurts to get future talent exposed to investors as well. A lot of REITs will take the CEO and CFO to investor meetings such as the one-on-ones held during REITWeek: NAREIT’s Investor Forum, but that’s not enough for Essex, which takes teams of executives and managers. “The process shows shareholders the strength of Essex’s entire executive team,” Schall says. REIT magazine surveyed REIT CEOs to gain more insight into how they and their companies view succession planning. 65% of respondents said their company has a clearly defined succession plan in place. 50% of respondents rated succession planning a 4 or 5 (on a scale of 1 to 5) when it comes to investors evaluating the company. 71% and 67% of respondents said leadership skills and real estate experience, respectively, were the most important traits in identifying a potential successor. 9% of respondent said experience at the company was critical to identifying a successor. REIT magazine surveyed REIT CEOs and asked them what advice they would give a potential successor. The suggestions were anonymous. Here are some of the responses. That same kind of visibility was key to smoothing his transition into the CEO chair, according to Naughton. AvalonBay announced that he would succeed Blair as chief executive right before REITWeek 2011, one of the REIT industry’s high-profile annual events. At the convention, Naughton had the opportunity to meet with major investors, analysts and bankers in his new capacity. Good succession plans also have good communication, both during the grooming process and when there’s an announcement. Executives must be kept in the loop as to whether they’re in the running, and who are other potential successors, experts say. After a move, communication is also critical, Blair says. In March of last year, three months before the transition to Naughton would be made official, Blair and his staff had to figure out how to get the word out internally and externally when the time came. For the announcement, AvalonBay offered an exclusive to the Wall Street Journal, with press releases going out later that same day. Internally, management announced the decision via emails and held conference calls in a town meeting style. In light of his new responsibilities, Naughton says maintaining those lines of communication both inside and outside the company has proved to be a bigger challenge than he expected. Waesche also points out that communication and setting expectations also help ease the transition process. Varied Experience. Candidates should also have had experience across the real estate spectrum, such as operations, capital markets and investments. “The more breadth of experience they can get in managing the various functional disciplines, the easier it is for them to ultimately integrate everything and step up and run the business,” Ferguson says. Vision. CEOs must lead the company in terms of growth, which means positioning it for the future. That could involve embarking on geographical expansion, moving into other property types, launching an investment-management business, or weighing whether to emphasize development or acquisition.